Calligraphy and the lettering arts enhance life with beauty, artistic satisfaction and useful skill, as well as delightful connections to art, literature, design, and other cultures. For more than 30 years, the Triangle Calligraphers’ Guild (TCG) has promoted the lettering arts here in the Triangle area and eastern North Carolina. Our members are calligraphers of all levels of interest and skill, from beginners and dabblers to part-time artists and full-time pros, and we all learn from each other. Facebook for Triangle Calligraphers Guild! Come see our talented member Ann Erickson’s calligraphy exhibit! Artist’s Reception: April 27, 2018 6-8 pm. Show will exhibit through June 23, 2018. The exhibit shows some of the varied applications of Calligraphy as an art form. Whereas calligraphy is often relegated to the wedding industry, to “crafting” orientations, or thought of as emanating from dusty scriptoriums, it is finally accepted today as fine art. 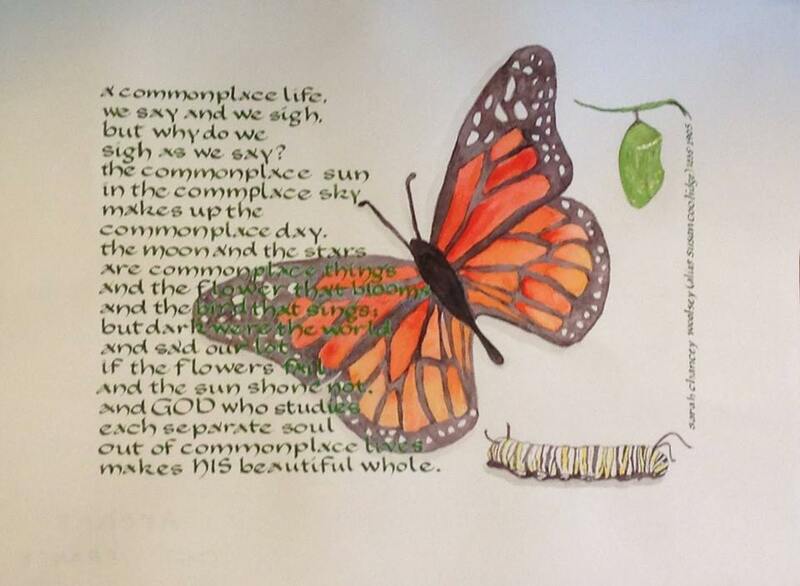 As a professional calligrapher for more than 35 years, Ann has used her gifts to produce illuminated manuscripts, resolutions, poems, quotes and scripture verses, as well as all aspects of wedding work. Illuminating with gold leaf is her favorite. For map and directions, view the Location section in the Meetings page. To view our current meeting schedule, please click on Meetings, or to see the titles and descriptions of programs we’ve had through the years, see Previous Meetings. To find info on Special Workshops, check out the Meetings, Workshops, and Blog sections of the website. August 2018: our guild’s annual Exhibit at Sunflowers Restaurant in downtown Raleigh. Having your work at Sunflowers is a wonderful privilege of membership for EVERY Guild member. Especially if you haven’t been part of this annual TCG tradition yet, make a plan to exhibit or visit with friends this year. April – June 2018: Member Ann Erickson’s exhibit at Cary Arts Center in Downtown Cary. The Wing’ed Pen in whose flight the soul’s expression soars! will be introduced with an opening night reception on Friday, April 27 from 6 to 8 p.m.
TCG members taught brush Italic to 99 students at Wake County Public Libraries in March! Congratulations to the Teaching Team: Stephanie Driver, Ann Erickson, Robin Gunter, Bruce Hawksworth, Dara Linn, Kerr Pelto, Bill Peters, Adrianne Proctor, Suzanne Roda, Patty Roemer, Anne Smith. Our library contacts were very happy with the team approach and want to continue the program next year. See photos from TCG exhibits and events on the Galleries page.